Bristol European Referendum Debate on Race Equality- you decide! The EU debate, and race equality will be one of the largest discussions on the subject in Bristol. Three racial equality organisations are teaming up to put on a European Referendum debate in Bristol on the 26th of May. 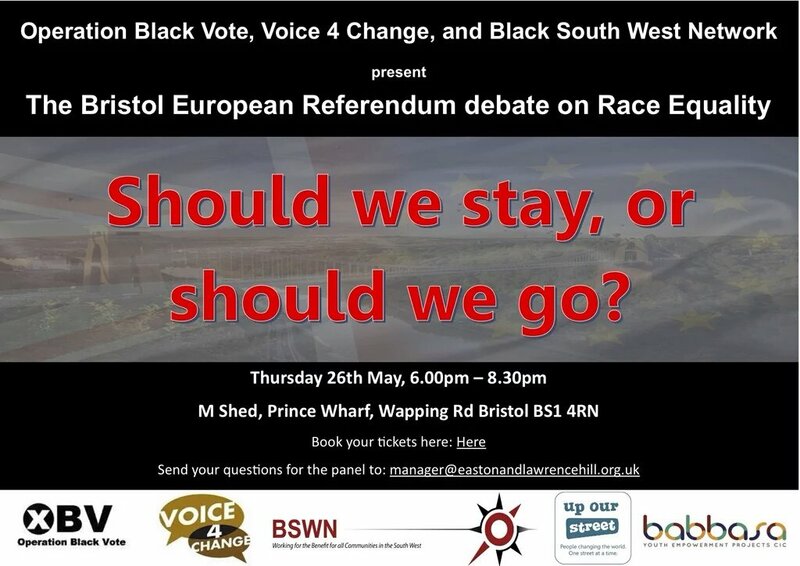 Voice4Change England, Operation Black Vote and the Black South West Network are holding this crucial debate from 6:30-8:30 in the evening at M Shed in Bristol, to encourage and promote voter registration ahead of next month’s referendum. These issues that are to be discussed will affect every person in Bristol that’s why we are encouraging a lively debate for the arguments for remaining in the EU and for those against. Our organisations are also very keen for people from BME backgrounds to register to vote. BME individuals are often less likely to be registered to vote than non-BME people. Our opinions are crucial in a healthy democracy, and events like these encourage more engagement from the diverse BME community in Bristol. Panellist to include representatives from both the Stay & Leave campaigns including elected members of parliament. The debate is also supported by Up Our Street, Babassa Inc, Hope Not Hate and the Somali Forum.